If you donâ€™t want to spend any money, consider going the Zip route. 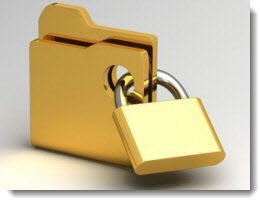 Most Zip managers, including popular freebie 7-Zip, give you the option to password-protect any zipped files and folders. Yes, you have to jump through the hoops of compressing and decompressing folders, but perhaps thatâ€™s not a big deal for stuff you access infrequently. No good? Then drop a few bucks on a utility like Folder Lock, which is designed solely for the purpose of, well, locking folders. Itâ€™s a little pricey at $40, so you might also want to check out Iobitâ€™s similar Protected Folder, which costs half as much. Of course, all these options overlook one of my favorite methods: misdirection. You could create a folder with the worldâ€™s most boring nameâ€“Widget Sales Projections 2007, for exampleâ€“and nestle it a few folders deep where no one would ever find it. For someone in your situation, with a computer thatâ€™s used by you 95 percent of the time, that might be the simplest and most effective solution. What do you think, readers? Whatâ€™s the best way for Ash to accomplish his goal?